A supermarket “city ham” is already fully cooked, so heating it isn’t essential. But a warm ham tastes better, and baking concentrates the meat’s flavor and improves its texture. 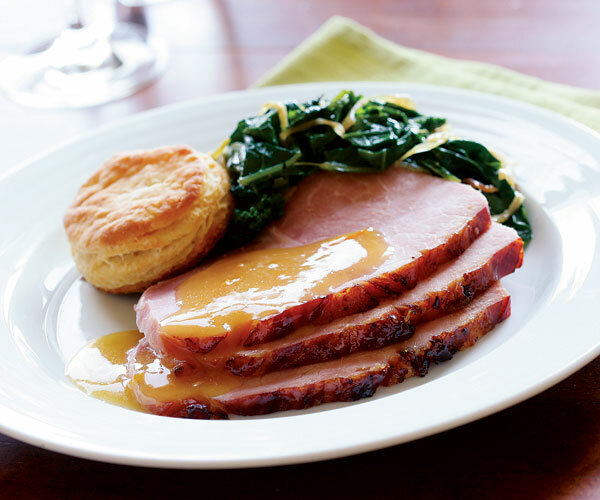 It also allows you to jazz up the ham with this citrus-tinged glaze. Watch the Video Recipe to learn how to score the ham, make and apply the glaze, and how to whip up a sauce using the pan juices. Position a rack in the lower third of the oven and heat the oven to 325°F. Trim away any skin and external fat to a thickness of about 1/4 inch. Set the ham fat side up and score the fat 1/4 inch deep with diagonal slices every 2 inches so that it forms a cross-hatched diamond pattern. Set the ham in a sturdy roasting pan or a baking dish. It should fit fairly snugly with only a couple of inches of space on any side. Add the orange juice, plus enough water to reach a 1/4-inch depth. Bake, adding water as needed to maintain 1/4 inch of liquid in the pan, until an instant-read thermometer inserted into the center of the ham registers 105° to 110°F, 1-3/4 to 2-1/4 hours (it should take about 15 minutes per pound). While ham is baking, gently warm 1/4 cup of the marmalade in a small saucepan set over medium-low heat. Stir in the brown sugar, ginger, and cloves to combine. Remove the ham from the oven and raise the temperature to 425°F. Add more water to the pan so the liquid is about 1/2 inch deep. Using a large spoon or pastry brush, smear the glaze generously over the top of the ham. Return the pan to the oven (even if it hasn’t reached 425°F yet) and bake until the glaze on the ham bubbles and begins to darken, 10 to 15 min; the ham should have an internal temperature of 120° to 125°F. Remove the ham from the oven and transfer to a carving board or large platter. Tent loosely with foil and let rest for 20 to 30 minutes while you make the pan sauce. During this period, the ham’s internal temperature should rise to 130° to 140°F. Pour the pan juices into a gravy separator or a 4-cup Pyrex measuring cup. Let sit for 10 to 15 minutes to allow any fat to rise and then pour or spoon off the fat and discard (some hams don’t exude much fat). Pour the pan juices into a 2-qt. saucepan, whisk in the remaining 1/4 cup marmalade and lemon juice, and bring to a boil. Taste the sauce, and if the flavor isn’t as intense as you’d like, continue to boil to concentrate the flavors as desired. Stir in about half the cornstarch mixture (called a slurry), and whisk until the sauce thickens slightly, about 15 seconds. Add more of the slurry for a thicker sauce. Set aside and keep warm while the ham rests. Carve the ham, arrange on a platter, and serve with the sauce alongside.